North Shields manager Graham Fenton and his management team lift the FA Vase. Picture by Ian Warde. North Shields manager Graham Fenton has praised his squad after they refused to show they were beaten. Robins fans feared their FA Vase run would end with heartache at the Wembley final as they entered the last ten minutes 1-0 down to Glossop North End – the first time in the cup run they had fallen behind. 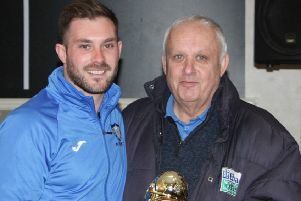 But top scorer Gareth Bainbridge headed home an equaliser in the 80th minute and then substitute Adam Forster fired the winner five minutes into extra time. Speaking after the cup triumph, Fenton – who won the League Cup during his professional career with Aston Villa – heaped praise on his players. He said: “My overriding emotion is one of pride. “I cannot praise this group of players enough, they just don’t accept they can be beaten. “We struggled a bit first half, perhaps the nerves played a part, but we just told them at the break to believe in themselves and go back out on the field and show everybody how good they are. Fenton also praised the 5,000 supporters who travelled down to Wembley on Saturday, adding: “It’s been a stunning time for the club. “Last season we were in the Northern League second division, now we’ve finished fourth in the first division within touching distance of the title. And now this. “This win is for the small group of supporters who stuck with the club to keep it going during some dark days. “And of course to those who gave us tremendous encouragement from the Wembley ‘terraces’. The support was unbelievable and much appreciated by the lads. Fenton, who won the League Cup in 1994, said: “I was hugely proud to play in the old Wembley, but this is different – this is a magnificent stadium, it’s got to be one of the best in the world, something the country should be hugely proud of.